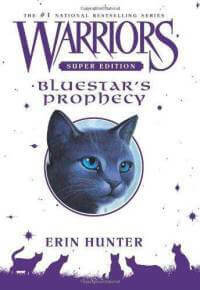 Bluestar’s Prophecy is a super-edition Warriors book, spanning the first five books of the Warriors series. It tells of Bluekit and her growing up years – her eventual ascent to leadership of ThunderClan as BlueStar.Erin Hunter continues writing with the same quality as the original Warriors books, and the story remains equally interesting. Still, a few things leave me not wanting to reread this book. While the Warriors books cover the life of Fireheart, a ThunderClan cat, this Super Edition takes a look at a side-story: the life of Bluestar, the leader of ThunderClan during the other books. The story begins with her birth and ends just before she accepts Fireheart into ThunderClan. The story adds dimension to many of the other Warriors books, and I personally found the story gripping. Bluefur is faced with a difficult choice as she must abandon her young, taking control of her clan and saving it from the bloodthirsty ThistleClaw, or flee with them to RiverClan, where her mate, Oakheart, awaits. My reservations with this book come with the spiritual content, or, as the cats name it: StarClan. This StarClan is present among the other Warriors book but I had not yet found it so obvious in the story. The entire book revolves around a prophecy about Bluefur, made by a sick old medicine cat which everyone is convinced is crazy. Bluefur receives her nine lives from the spirits of her dead kin in StarClan. The book is full of such things. Obviously, in a book about cats written for elementary/middle-schoolers, there wouldn’t be too much true spirituality, but this book is full of the exact opposite. Overall, for a book written for fifth graders, Bluestar’s Prophecy is well-done. The story is exciting (even for me, a senior in high-school), and the reading level is easy enough for the age range mentioned above. Still, the spiritual content in it really leaves me somewhat disturbed, thus I don’t recommend it, and I’m also almost tempted to withdraw my previous recommendation of the rest of the series. The “spiritual” side of this series becomes deeper and deeper as it goes along, and I have left off reading any more of these for that reason. 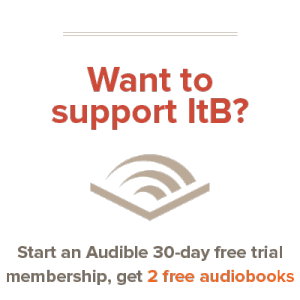 I’ve read the entire first series, and two or three specials. I started on the “New Prophesy” series, but that name alone was enough to make me put it down pretty quick.